← The Winning Social Buttons Are Live! Where to input new universal .js tracking code? My property is listed as Hubpages.com, rather than my subdomain url, and there is no “universal analytics upgrade” link. Confused? I am a little confused as I am not getting the ‘Universal Analytics Upgrade’ option under the second column and as shown in the images. I did somehow manage to create a new property and got a new code which I have changed here on Hubpages, but not sure how to get the upgrade without being given the Transfer option. UA and what we can learn a lot more, thank you for sharing this. @Kamal – no need to worry about implementing the new tracking code. We will take care of that part! @Susana – It’s OK if your property is listed as HubPages rather than your subdomain. The name doesn’t matter, it’s just for your reference. If there isn’t a link to transfer, then you’re HubPages property is already set to UA. @mistyhorizon2003 – If you created a new property, it will be UA by default. Your old property may already have been UA too (especially if you did not see an option to upgrade). This is all Greek to me. However, I’ve never understood how to use Google Analytics or what good it would do me to do so. I’m not going to bother to work out where all these codes go and where I’m supposed to find them. Sorry, I’m allergic to bureaucratic mumbo-jumbo. What happens after 20 August 2014 if I choose to ignore the deadline? Do I turn into a frog? @Larry Fields Using Analytics is completely optional, so it’s up to you to decide if you want to sign up (or upgrade if you already have Google Analytics). If you have the old version of Analytics and have not upgraded by the 20th, you will lose access to your traffic data for your HubPages account. Thanks, Christy. Traffic data is a good thing. However I still have the same problem. I’m still allergic to bureaucratic gobbledygook. Your IT people are making the Google Analytics upgrade look like a cross between the Obamacare website and the Department of Motor Vehicles. What some of us non-bureaucrats here at HP need is a simple, one-click “Make it so” button. You know, like Captain Picard used to say. Is that too much to ask? I did apply for Hub Pages upgrade as well as another property but I still don’t see Universal Analytics anywhere and I keep getting – Have you upgraded?’ I don’t know what else to do. i never used analytic account. If i don’t upgrade now will i also loose the statistics from my hubpage ” My Account ” Page . I created a new property under an old analytics account, and I assume it’s UA. I pasted the new code under “Reporting Settings” under the Earnings tab. According to HubPages, the status is active. According to Google, the status is “Tracking Not Installed”. Do you know why this could be? Do I just have to be patient? I am not getting the upgrade option either. Google completely confounds me. I do not remember upgrading. I am always worried I have done something wrong because it seems Google makes you feel like you are chasing a wild goose with their “instructions.” Plus, I am still seeing “Classic” on my Google Analytic pages. Something isn’t right. I know it is user error on my part, but I am not sure why it has to be so difficult unless they don’t want it to be easy so they don’t have to pay – which they never have. LOL Sorry for the ramble, but I have spent my morning trying to figure this out. As usual, I want to pull my hair out. I give up. This updating is far too complicated for me. Even with help I couldn’t get it done. I’ve never understood how to use Google Analytics or what good it would do me to do so. I’m not going to bother to work out where all these codes go and where I’m supposed to find them. I am a little confused as I am not getting the ‘Universal Analytics Upgrade’ option under the second column and as shown in the images. I did somehow manage to create a new property and got a new code which I have changed here on Hubpages, but not sure how to get the upgrade without being given the Transfer option. What if there is no upgrade button but after 20th of August we cannot see our data anymore as if we have not upgraded our account? Honestly, I have been trying for quite sometimes now but it is not responding. Please what can I do? I think Google Analytic s is the most user-UNfriendly site on the net…I think it was developed by a computer programmer and not built for the average person. I just spent hours on that site and never saw any reference to an upgrade to Universal, so maybe I did it already, but I don’t understand the instructions above as to how I confirm that. I get very little activity through HubPages on Google anyway, so I guess it doesn’t matter too much. I never bother much with seeing where my traffic comes from, I just write because I like to. I looked at the Google Analytics page, but don’t usually. It’s Greek to me. If I don’t do this, will I be able to see how many readers I have to each hub? It’s too complicated unless you are a computer geek. 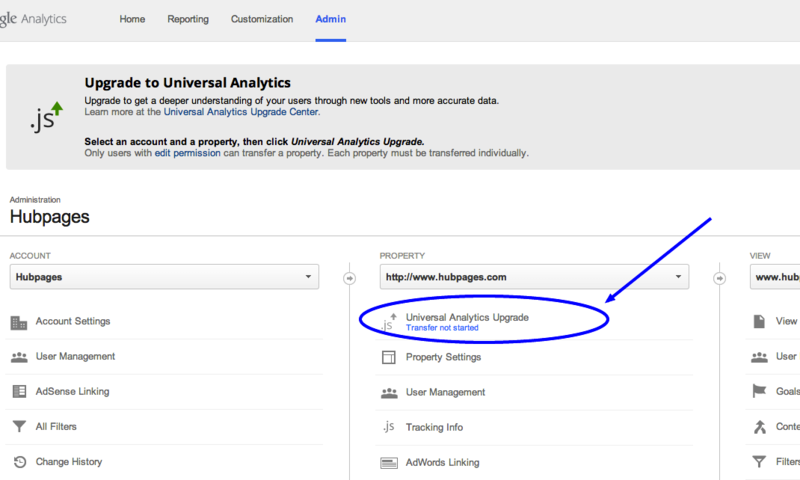 On my Google Analytics Admin page there is no column that shows a Universal Analytics Upgrade option. I went to my HP account page to settings and I do know how to confirm if I have Universal Analytics, I only see Google Analytics. I am really confused and have gone over and over the instructions and am getting no where. Please advise. 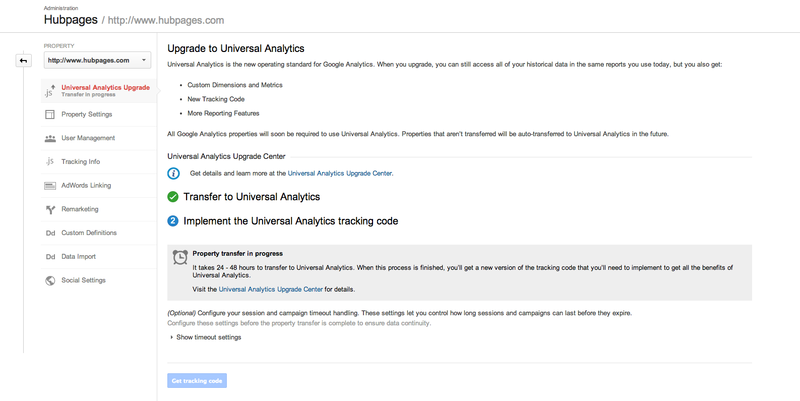 PS: on my settings page where it says Google Analytics, will that change to Universal Analytics if I am already transferred? I really need help to understand all this. When you’ve already upgraded, would your affiliate code be like: UA-…….? I am just curious because just like the rest, I am confused big time. Thanks! Is it necessary to go through all of these steps on the google analytics page and transfer and all that jive? (cos i went there and i never found a transfer button) Can we just use the UA tracking code found in the Google analytics account and use that to configure the UA in the reporting settings section of our earnings tab here in hubpages??? @Blake – Yes, a new property created in an old Google Analytics account should be UA by default. Can you send a screenshot of the “Tracking Not Installed” message to team@hubpages.com? I will take a look and see what’s going on with that. @sholland10 – I’m sorry for the confusion! Take a look at my comment to Anita Saran above. See if your Google Analytics UI matches what’s in my screenshot (specifically, the “Tracking Info” menu and the lack of a blue transfer button). If it does, then your HubPages property is already set to UA and all you need to do is confirm in your HubPages account. @friv 2014 – Google started auto-upgrading properties to UA, and many Hubbers’ properties have already been upgraded. If that’s the case for you, then all you need to do is confirm in your HubPages account. I know it’s confusing, but the tracking ID does not change after you upgrade to UA, only the tracking *code*. Hubbers don’t need to worry about updating the tracking code; we will take care of that. @Clint Chidiebere – If the GA site is not responding, I would file a bug report with Google. @Jan Peterson – Do you see the “Tracking Info” menu on your Google Analytics admin UI, under the HubPages property? If so, then your property is already using UA. @Jean Bakula – If you don’t upgrade, you will still have traffic stats in your HubPages account, but you won’t have traffic stats in your Google Analytics account. It sounds like you prefer to the HubPages stats anyway, so you don’t need to worry about upgrading. After you do that, you’re done! @Arnii – great question! Your individual tracking ID (UA-XXXXXX) doesn’t change when you upgrade to UA. It’s just a setting in your Google Analytics admin interface. The tracking *code* changes, but HubPages takes care of implementing that across the site, so nothing for Hubbers to do there. Uhm, what does this mean? I have two Google accounts that I do NOT want connected with this. How do I set-up a new account? How do I tell Google to quit stopping me from setting up one for this? I was just getting started on HubPages. I was excited. Then I saw this notice: It’s Time to Upgrade Your Google Analytics Account. I don’t trust Google. I don’t like that they are trying to force me into using Google +. I don’t like that they are trying to force me to use my real name for my YouTube account. I don’t trust them. I don’t understand this stuff. I really am disappointed in this. @horsecrap, Google Analytics is completely optional. You don’t have to use it if you don’t want to. Do you mean we will not lose payments if we don’t upgrade? If not upgrading means I lose $$, I have to upgrade. Can’t afford not to. If not upgrading has nothing to do with payments, then I’d rather forget about it. You will not lose any money either way. Your payments are completely separate from Google Analytics. Analytics is just a platform some Hubbers use to see more data about traffic and visitors to their Hubs. It’s completely optional and there will be no negative consequences if you choose not to use it. There seems to be much information or misinformation on this upgrade to Google Analytics. But no indication as to cost. Why and if any what is it. What is the cost. @John Ward, Google Analytics is completely free. I cannot find the blue Transfer button or UA upgrade on my Google Analytic account. What is the problem. Please help. Thanks for the reminder.. I still need some time to do this..
this is confusing. I went into my analytics and clicked some stuff but have no idea if i was successful. Thanks. This is a very helpful post. Just now upgraded to Universal Analytics. I look at my stats page from the HubPages, and it tells me that my Google Analytics Account is not active. I do not know what that means. I have two accounts with Google. I got to the terms and conditions for google analytics, but the window would not scroll down for me to agree. I am not sure if I am signed up or not. I am completely confused with this!